Single Phase Machine Tool Oil Chiller. 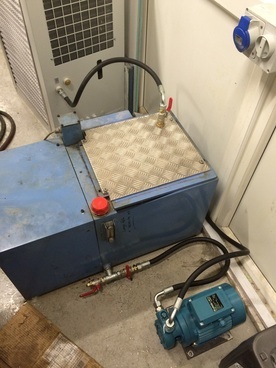 ​Refcool were recently asked by one of their service contract holders, a leading supplier to the construction industry, to source a replacement for an old coil in tank oil chiller on a machine tool which was beyond economic repair. An exact replacement, that met EU standards was unavailable and the best approach was to pump the light oil from the small holding tank through a specially built oil chiller and return it back to the tank. The oil has to be maintained around 20°C. 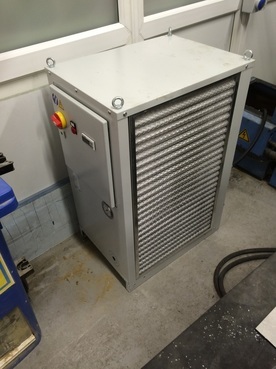 Refcool worked with a leading European manufacturing partner to source the 2.5kW single phase chiller with remote pump to fit the limited space available. A covering plate for the tank was fabricated and the unit was connected using custom hydraulic hoses for maximum longevity with the pump being floor mounted on a base plate. Refcool supplied, delivered and installed all the equipment and commissioned the system within an agreed timeframe also decommissioning the old chiller for safe and ethical disposal. The new chiller will be serviced and maintained with other chillers on site as part of Refcool’s ongoing service plan arrangement – please contact us for more details or a quotation for this service.